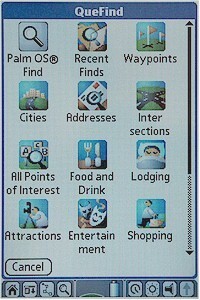 Palm organizer (PDA) with built-in GPS receiver. Large, easy to read color display. Supports auto-routing with voice guidance. Installable base map. Comes with docking station for data exchange. Well suited as a hand held device or to be used in all kinds of vehicles. The GARMIN iQue 3600 is the perfect combination of a personal digital assistant (PDA) and a GPS receiver. The GARMIN iQue 3600 provides automatic route calculating, visual and voice guidance, is easy to use, has a multilingual user interface, a large, easy to read color display and an extremely sensitive antenna. The iQue 3600 comes with various loadable base maps of America; Europe, Africa and the near East; Asia and Oceania and a world map plus detailed maps of Europe. There is 32 MB of built-in memory to store even more detailed information, such as local roads, restaurants and other points of interest. In addition, there is a slot for an optional SD card to extend this memory. 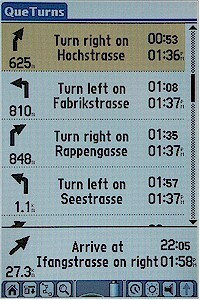 The iQue 3600 provides navigation information outdoors, in a car, in a train or even in an airplane (see MapSource examples). Multilingual user interface (English, French, German, Italian, Spanish). Voice prompting in 9 languages (Danish, Dutch, English (UK and US), French, German, Italian, Spanish and Swedish). Install any of these languages from the CDrom that comes with the iQue 3600. 32 MB built-in memory to download additional, even more detailed maps with roads, crossings and addresses of restaurants, public buildings, points of interest etc. from a PC. (memory shared with installed applications). Slot for optional standard SD memory card, you may use this memory to store card data. 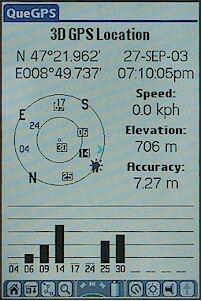 Routing speed: 1.72 (see GPS Routing Speed for details). Suited as a hand held device or to be used in any kind of vehicles. Mounting kit and power cable with speaker available as an option, does not require any installation. 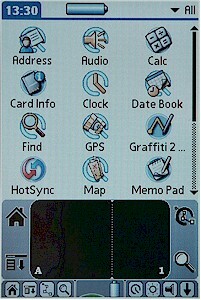 Palm OS V5.2 with many applications such as calendar, contacts (seamless integration with find address function), memo pad, calculator and more. Install additional applications as needed. 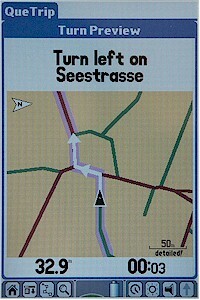 CDrom with Palm Desktop included, provides data exchange with PC and supports installation of detailed maps. Powered by built-in, rechargeable battery, by an external 12 V power source, e.g. from a car's lighter (power cord available as an option) or by the included power adapter. Mounting kit and power cable with external speaker available as an option. 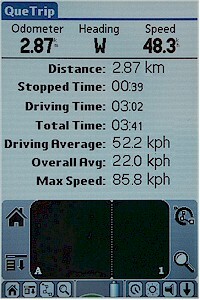 Finds routes almost twice as fast as the GARMIN StreetPilot III, see GPS Routing Speed for more information. Stores up to 32 travelled routes (tracks) with up to 500 trackpoints each, up to 5'000 trackpoints in total. Supports various recording modes. This model has been discontinued; however, you can still order options for the iQue 3600. 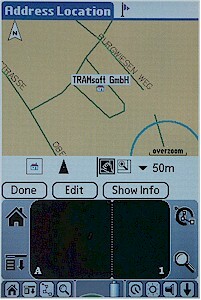 All options for the GARMIN iQue 3600 in detail, find maps here. This is MapInstall V3.0, which replaces the MapInstall software that was shipped with the iQue 3600 (iQue 3600 Setup CD versions 2.01 and 2.02). An initial installation of the Palm Desktop for Garmin iQue must be completed before installing this update. Track Conduit allows you to transfer saved and active track logs from your iQue to your PC. Once Track Conduit is installed, every time you HotSync your iQue to the Palm Desktop, the tracks are automatically saved by default in the C:\Program Files\Palm\'user'\Tracks\ directory as 'Tracks.mps'. An initial installation of the Palm Desktop for the Garmin iQue must be completed before installing Track Conduit. 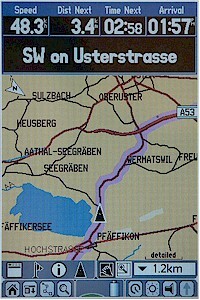 In order to view the saved tracks file, you need to use MapSource V5.0 or higher. Transfer Waypoints allows you to open a saved MPS (MapSource file) to transfer the waypoints in the file to your Palm Desktop address book. An initial installation of the Palm Desktop for Garmin iQue must be completed before installing this Palm Desktop Addin. Voice Guidance Backup is a utility that can run on the iQue 3600 to save (backup) the voice guidance files to an expansion card (SD or MMC). Voice Guidance Backup requires iQue 3600 Release 3 software to be installed in order to function properly. When used with Release 3, the voice guidance files stored on the card will automatically be restored if they are not present on the device. 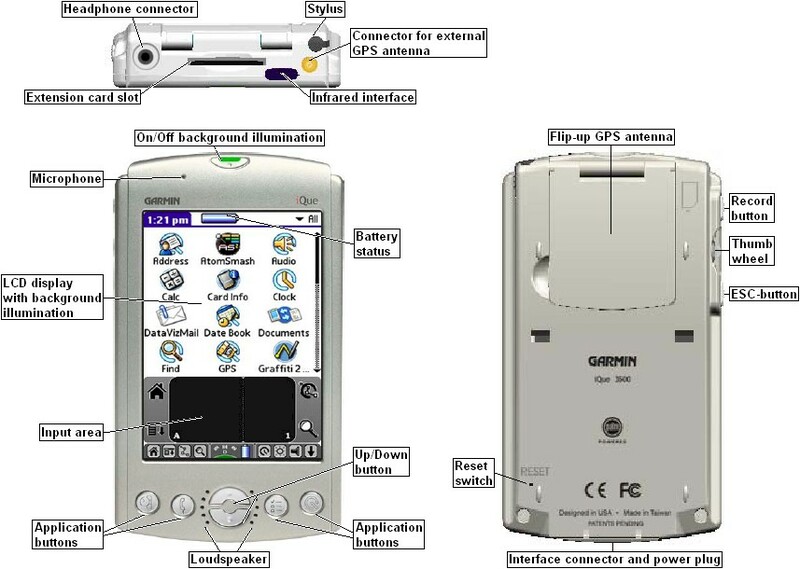 An initial installation of the Palm Desktop for Garmin iQue must be completed before installing this utility. This software requires the use of an expansion card (SD or MMC).